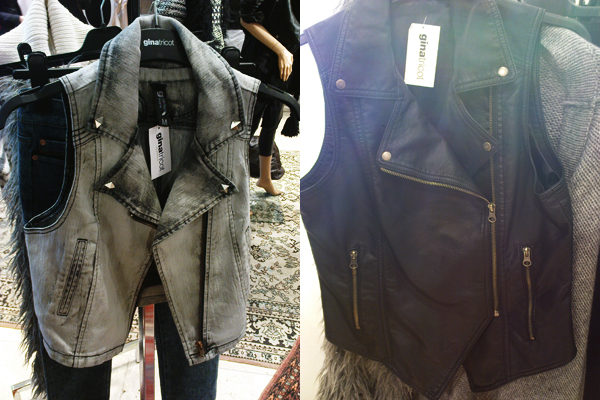 THE Jacket, boyfriend jeans, asymetrical grey longsleved t-shirt, denim vest & leather vest, all from Gina Tricot, pictures by me. GINA. 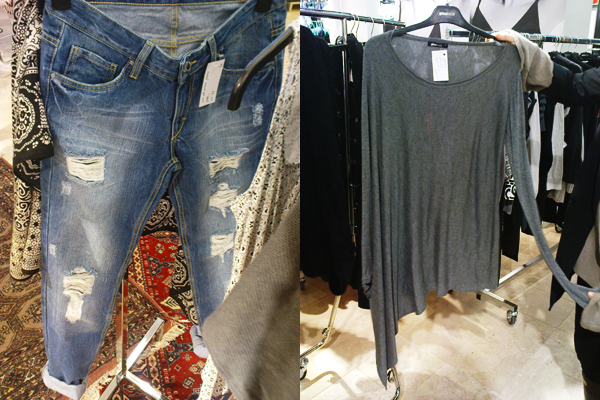 I went to Gina Tricot to have a look at their fall 09 collection earlier this morning and I must say I really liked it. I definitely need to buy the studded jacket when it hits the stores. This entry was posted in Fashion, Inspiration, Uncategorized and tagged Fall 09, Gina Tricot, Studded jacket by Carolina Engman. Bookmark the permalink. oj oj oj så fina grejer. Gina Tricot kan ibland dom! Ridiculous! That studded jacket is perfection. I’ve never heard of this designer before, but I will definitely look into it further. Jag tror precis jag dog av snyggchock! Den jackan! oooh the jeans and the shirt! i want want want. I absolutely love everything, the studded jacket is amazing, I love the jean, the tee shirt…. !!!! AWESOME!!! I defiantly going to get me some of that!! omg that jacket. i need it in my life. Oh my god, it’s soooo lovely, what a shame I don’t live in Sweden or one of those other lands they sell it. Love your blog! när kommer jackan ut i butik ? 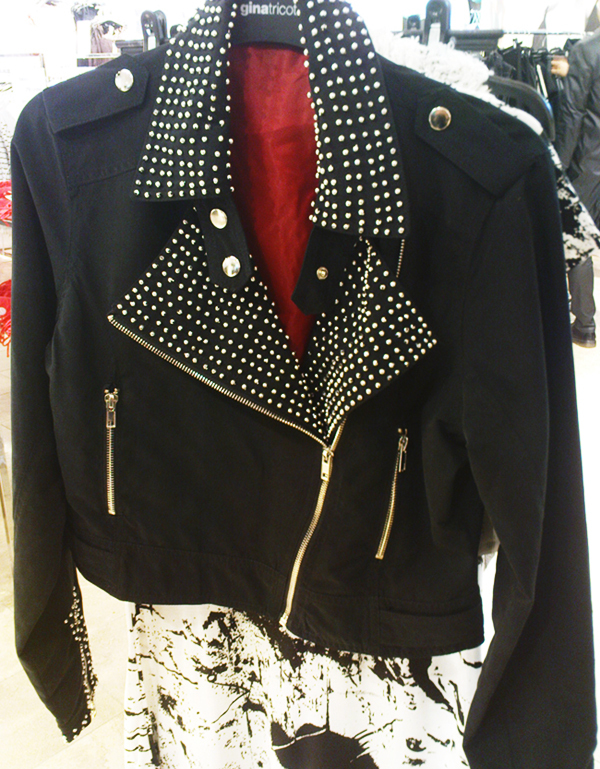 This studded jacket is really amazing ! NEED that jacket, really… Lovely post! längtar efter den kollektionen som tusan! vet du när den kommer ut? i want those vests real bad. I love perfectos like these! I saw a video of Dree Hemingway and she found an amazing purple one which looked fabulous on her. diggar den gråa tröjan och de västarna. jättefina! Sooo, that jacket is amazing. In fact, all of this stuff is amazing. I LOVE the studs on that jacket, the way their on the lapel… need I say more???? wow. all of this stuff is awesome. especially the studded jacket. why oh why don’t they ship to the U.S.! lol. Nadja, Jennifer: Nix, återkommer när jag har fått svar från presskontoret! Nadja, Jennifer: Den finns i butik fr.o.m. v. 30! These are all fab!!! Is there a website I could shop on??? I love the vests and the biker jacket. i just bought a leather vest at Urban Today that looks just like that one! like exactly! and Planet Blue makes a lot of shirts that look like that asymmetrical one in all different colors. i love all the stuff! how do u get to see the collection before everybody else? vaaa hatade gina, ska lätt köpa! i cant really figure out what to say. Ah, elsker jakken med studs! !